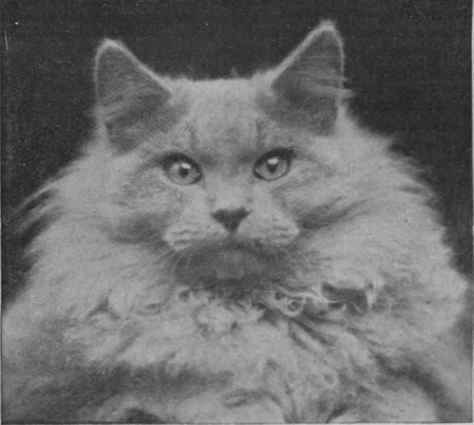 Previous to this the breed had been known as "London Smokes," but gradually, through the determined efforts of Mr. Clarke, well known as one of the pio-neers of the National Cat Club, Miss Frances Simpson, and various other breeders, it was improved so greatly that in 1889 a special class was created at the Crystal Palace Show for " blue, self-coloured, without white." In the following year Brighton also adopted the "Self Blue" class, and from that time forward the breed has improved by leaps and bounds. 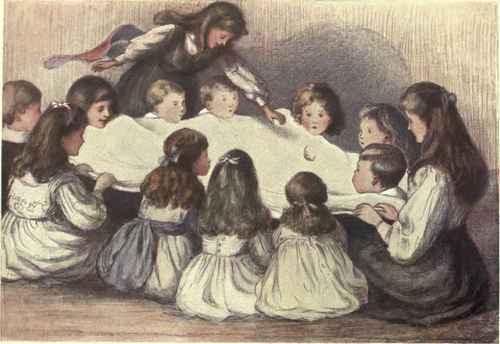 In this same year (1890) blue kittens were entered for the first time in competition with the black and white, there being eight entries in each class. Miss Frances Simpson's Beauty Boy carried off the first prize for males, and Mrs. H. B. Thompson's Winks the first for females. So rapidly did the popularity of the blue increase, that a year later there were thirty-two entries in the Crystal Palace Show. The blue Persian, so like silver fox fur in colour, varies from a pale lilac to a deep slate blue, some fanciers preferring one shade and some another. A good medium blue is the colour most sought after by breeders. The fur must be even in texture and long throughout, the same shade continuing to the roots, so that when the hair is blown apart there is no difference in colour between the inner and the outer portion. Well-lined, small ears, with a forward poise, are greatly admired; the eyes should be full, and orange or bright amber in colour, the former being the more prized. Though the head must be broad and round, with width between the ears, the face and nose should be short, the face being well covered and the cheeks developed. The nose and pads are a shade darker than the rest of the colouring. Some fanciers prefer a long body, but this is a matter of personal taste; the cobby body, low on the legs, gives, as a rule, a better appearance to the cat. The tail ought to be short and bushy, and the feet moderately small, though not stumpy, with perfectly straight toes, especially in the forefeet, and well covered with fur. The cat should have long, strong whiskers, which denote strength in their owner; and a feature of great importance is a well-developed frill, extending round the neck. As nearly one-third of the marks awarded are given for the coat, it can easily be seen how important it is to keep it in good condition. Sometimes a kitten will show the dreaded tabby markings or a poor frill, but this frequently rectifies itself when the coat is changed. Great care is necessary when choosing a sire, for there are pedigrees and pedigrees, and frequently a cat which sounds well in an advertisement will prove, upon closer acquaintance, to be anything but desirable; therefore, when possible, always see him before making final arrangements. Though it is best to mate a blue with one of her own colour, a black can be used with safety, the result being generally that the kittens are of a darker colour. 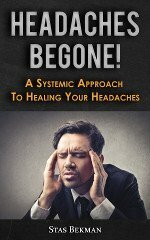 Choose a male that will be likely to counteract the weak points in the "Queen," or female. For instance, should the female possess eyes of a bad colour, see that the male chosen has perfect orange orbs, and hope for the best. Curiously enough, the original blues shown by Miss Frances Simpson were the progeny of a blue paired with a tabby, but the remaining two of the litter were tabbies. One of these kittens was quickly bought at its catalogue price, Miss Frances Simpson buying in the other herself, from which have been bred many well-known blues. Mrs. W. R. Hawkins' Wooloomooloo and Mrs. H. B. Thompson's Don Juan were both very celebrated sires in the early days of the blue, and many prize-winners trace their ancestry to one or other of them. Big Ben, a son of. 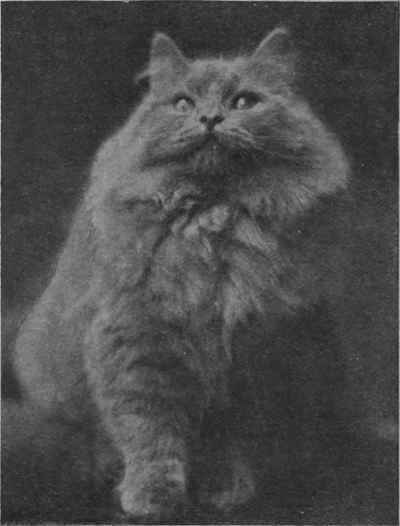 Blue Boy II., owned by Miss Frances Simpson, has sired numbers of famous kittens since the year 1908, when he was a prize-winner in the kitten class at the Crystal Palace. He has a massive broad head, with beautiful orange eyes; and his kitten Cherub, owned by Mrs. Chilcott, of Winkfield, Windsor Forest, bids fair to become a magnificent specimen, with its wonderful ruff and coat, being already a little prize-winner. Miss Wilson, of Purley, possesses a perfect blue in Sir Archie II. of Anandale, who has to his credit not only numbers of first prizes, but five N.c.c. championships. He began his victorious career in 1907, when only seven months old, by carrying off a challenge trophy at Birmingham. Billy Button, the property of Miss G. R. Savory, a famous cat, gained the first prize for blue males at the Crystal Palace (1909). The cost of a blue Persian depends largely upon his points; high prices may be given for a good specimen, but quite a nice cat can be purchased for £1 or £1 10s., provided it is not required for show purposes. Not long ago a lady refused an offer of £60 for her blue, and £160 was cheerfully paid by another purchaser for a cat that she wished to send abroad which possessed the exact points that she required.